Check out more photos from this post in our Photo Gallery. Kirk's 70th birthday weekend extravaganza got off to an earth-shaking start! As you may have heard Mexico suffered its largest earthquake in 100 years, a 8.2 off the coast of Chiapas, nearly 1,000 miles to the south of us. Incredibly we felt it all the way north in Puerto Vallarta...and it was eerie. Our good friend and fellow sailor John had just arrived from Seattle to help us celebrate the Capitán's birthday. (You may remember John as one of our crew as we sailed south from Seattle two-years ago.) At 11:45pm we were sitting in the condo living room catching up, when Heidi suddenly felt quite queasy like she had vertigo? For a split second she wondered if she were having a stroke, as that was just how Kirk had felt before his stroke in February... as she turned to tell Kirk she didn't feel well, she saw a quizzical look cross Kirk's and John's faces, and noticed the cats staring out the window like they'd seen a ghost... and the exercise ball was rolling back and forth on the floor with no one near by it at all. We quickly realized that the high-rise condo we were in was gently swaying back and forth in a sickening, rolling motion. We've experienced 30-40 knots of wind here before and the building didn't move. This time there was no wind, and we were definitely moving... WTF?! We all looked at each other and wondered allowed, "EARTHQUAKE?!" We'd also experienced earthquakes in Seattle where the building really shook...this was not that. John, our resident rocket scientist (for real) pulled out his phone with an Earthquake App, and confirmed an 8.2 off the coast of Chiapas. Yikes! We learned the quake was felt as far away as Baja and Panama...then just as we were getting ready for bed, we heard that a tsunami warning had been issued for the Pacific coast of Mexico...potentially arriving in Puerto Vallarta within hours. Double Yikes! We threw our clothes back on getting ready to head to the boat at 0-dark-thirty to double check lines and be sure Due West was secure (even though we'd just been there earlier in the day, and we already have her very secure for the daily tropical thunderstorms.) As we were headed out the door to catch a cab to the marina, (and trying to explain to the cats why we went to bed, then got back out of bed, re-dressed, and ready to go, LOL.) they called the tsunami warning off for PV and north. Phew, lots of adrenaline pumping that night. Rocket-Man John and Blues Man Frosty toasting El Capitán at Bodegita del Medio. Longtime Seattle friends Frosty & Patti arrived the next day missing the earthquake excitement. 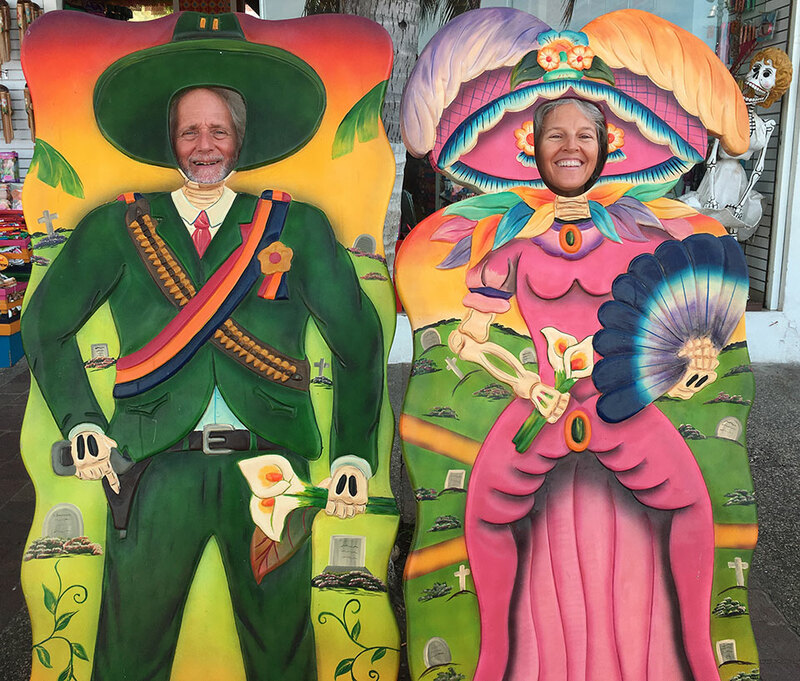 We've sailed with them for many years around Puget Sound, and Kirk also sailed with them down the coast to Sausalito on their second cruise to Mexico ten years ago. It was SO great to have such good friends here to help celebrate Kirk's big birthday. 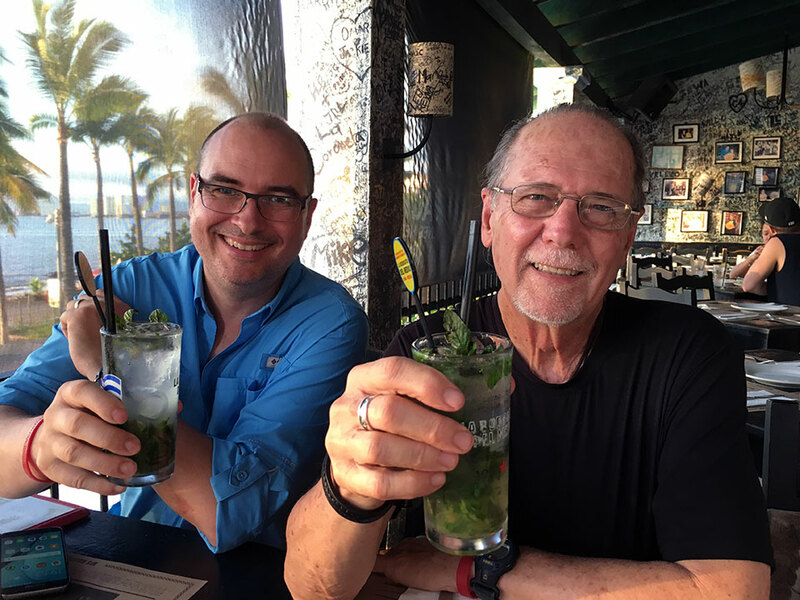 That night we headed out for dinner to our fav resturante Cubano, Bodeguita del Medio, afterwards walking along the Malecon to watch the nightly fireworks display. We had watched and wondered about the weather all week, hoping the weekend would be clear for our planned outdoor activities. Saturday dawned beautiful and more local cruising friends, Fred, Judy, and Lisa arrived from La Cruz, across the Bay. And our wonderful friend and taxi-driver Alberto rounded out the party along with his wife Alva. 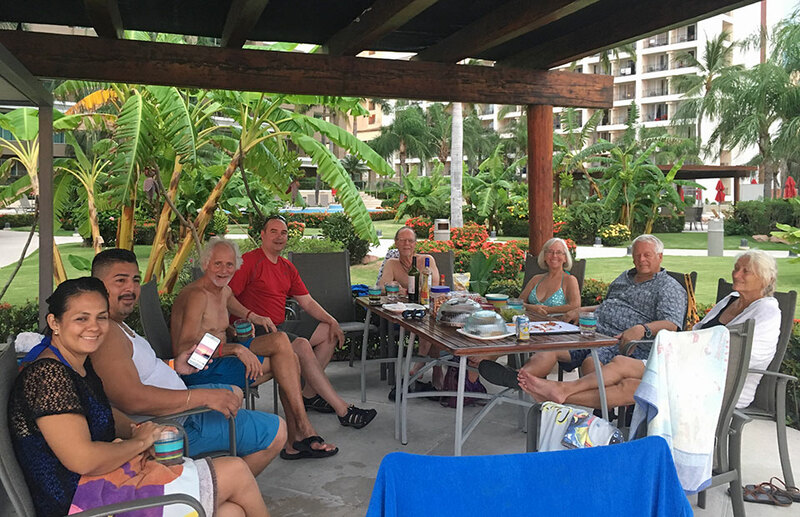 We commandeered a palapa sun-hut by the pool with lots of food and drink, stories and swimming, and of course brownie-cake with coconut icing. Yum! 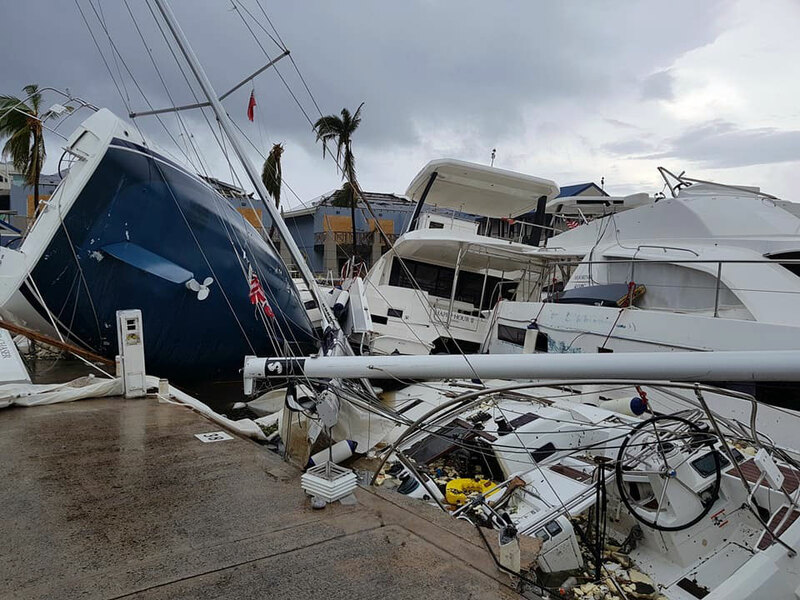 Speaking of weather, we had one eye on Hurricane Irma all weekend, as it blasted through our favorite Caribbean Islands, decimating some of our most memorable cruising grounds, and leaving friends homeless and boats sunk. So Heartbreaking! 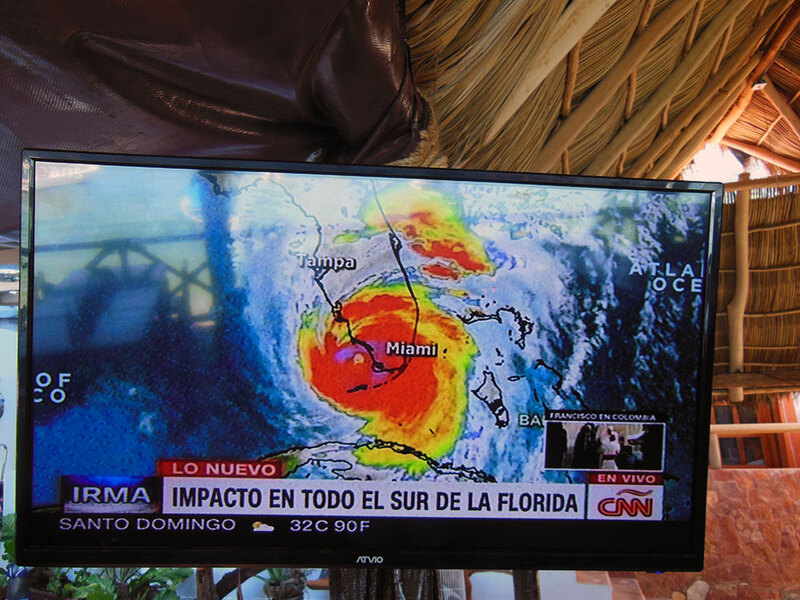 Irma was due to smackdown Florida where Kirk's brother Galen and his wife Ann live, along with our nephew Mike, Sara, and boys, and Patti's sister lives in FL too. We downloaded the new walkie-talkie app Zello, which was a REALLY cool way to keep in touch with them as they battened the hatches in Naples. 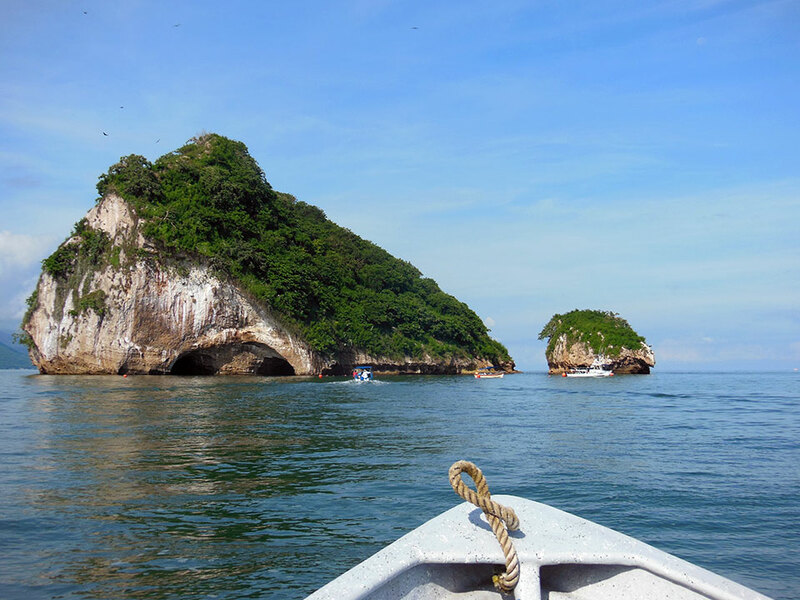 Our panga tour started in Mismaloya and stopped at Los Arcos, Las Animas, Quimixto, and Yelapa. 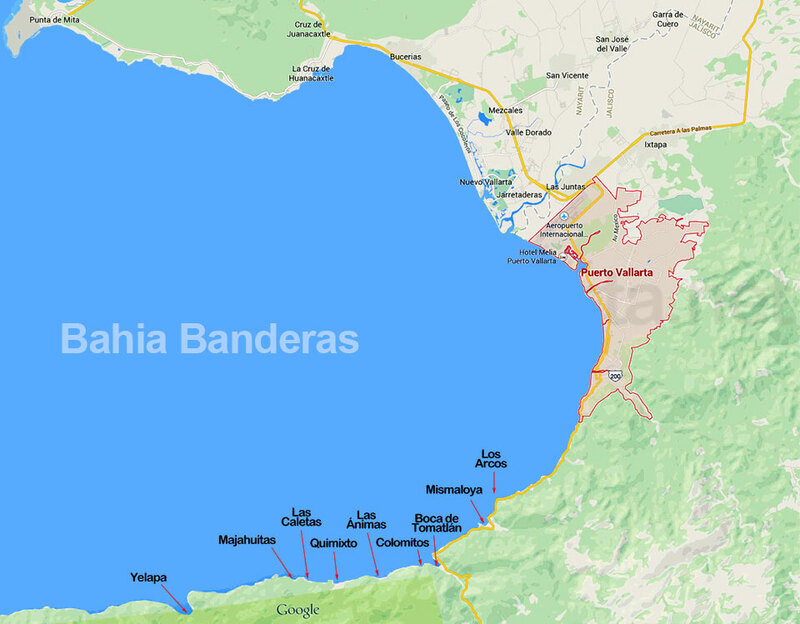 Sunday the forecast looked iffy for our Panga Tour of Banderas Bay. But the sky looked good so we headed out anyway after a quick chat with Galen and Ann, wishing them the best. 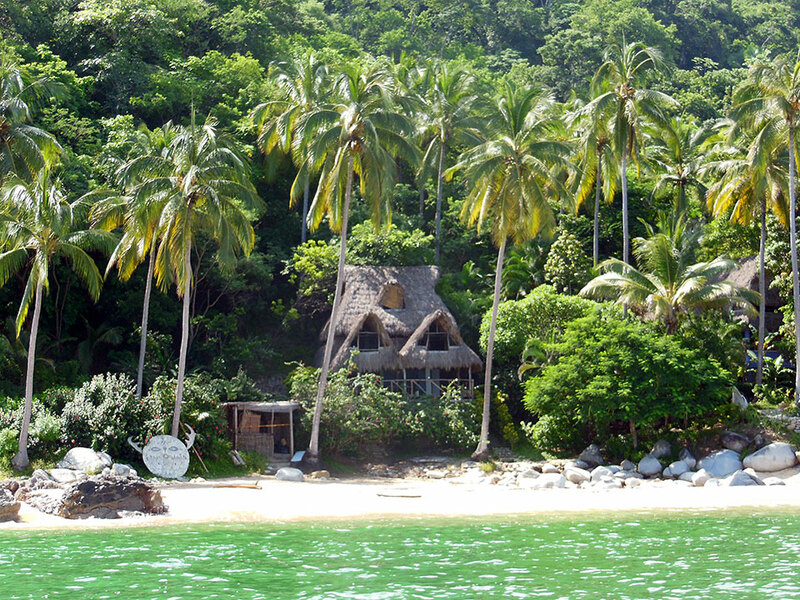 We had planned to take the bus to Mismaloya to meet our friend and tour-guide Juan Bravo - but after we gathered our snorkel gear, towels, food, and drinks it was a bit much to schlep it all on the bus, so we opted for a taxi at the last minute. 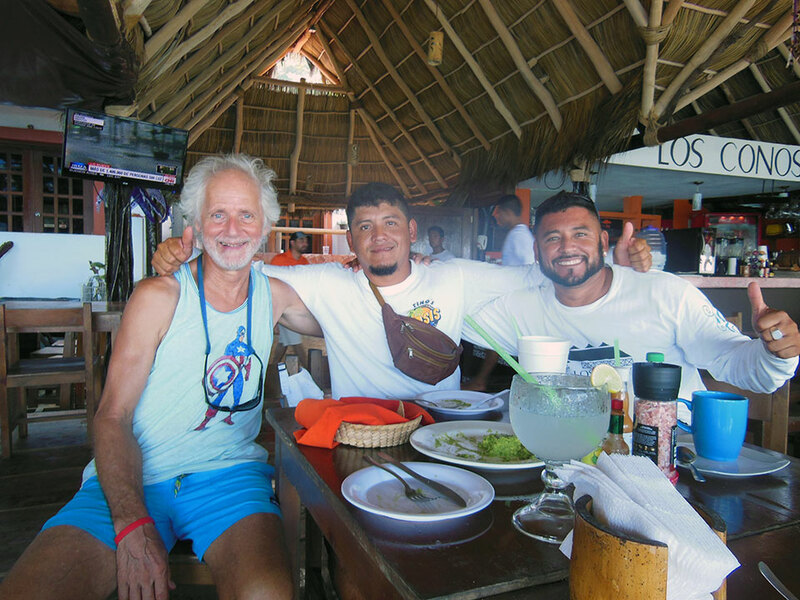 Juan met us at the bus stop and along with his brother Israel we headed out from Mismaloya in their panga. First stop: Los Arcos, "The Arches" where Kirk and I had snorkeled 20 years ago. Unfortunately the water was pretty murky from all the recent rain and river runoff into the bay. So we decided not to snorkel there. But Patti wanted to swim, and there were a lot of fish that Juan wanted to show us--so we stopped the boat while he fed the fish and brought them to the surface. Beautiful multi-colored angelfish and sergeant majors abound. With Patti back aboard, our tour almost ended before it began when the engine wouldn't start... dead battery. Kirk, Isreal, and Juan Bravo, lunch at Los Animas. So we borrowed a spare battery to get us back to Mismaloya where we picked up a new battery and started out again...Welcome to Mexico! Take two... off to Los Animas for a delicious lunch on the beach with all eyes on Mexican CNN in the background - trying to decipher the spanish report of what was going down in Florida. We got Galen on the walkie-talkie again, during the hurricane before the eye hit. So far so good, we kept sending love and good juju to Florida. Irma made it a bit hard to celebrate, but we knew that worrying wouldn't do a thing to help, but positive energy could, and they would want us to be having fun anyway. Normally you can get to the waterfalls via hiking trail or riding horseback (which we had done 20-years ago), but all of the horses were out on the trail already so our only option was to hike this time. The trail was pretty muddy and there were two rivers to ford. Heidi, not wanting to fill her Keens with mud, opted to hike the two-mile trail barefoot...and thought it was really grounding to feel all that mud squishing up through her toes. Wouldn't you know that in the very narrowest part of the trail in the middle of a ravine cut through the rocks just wide enough for a single-file horse trail - we came head-to-head with the whole herd returning. The five of us hikers were literally clinging to the sides of the crumbling rock wall while about 20 horses slowly ambled by. 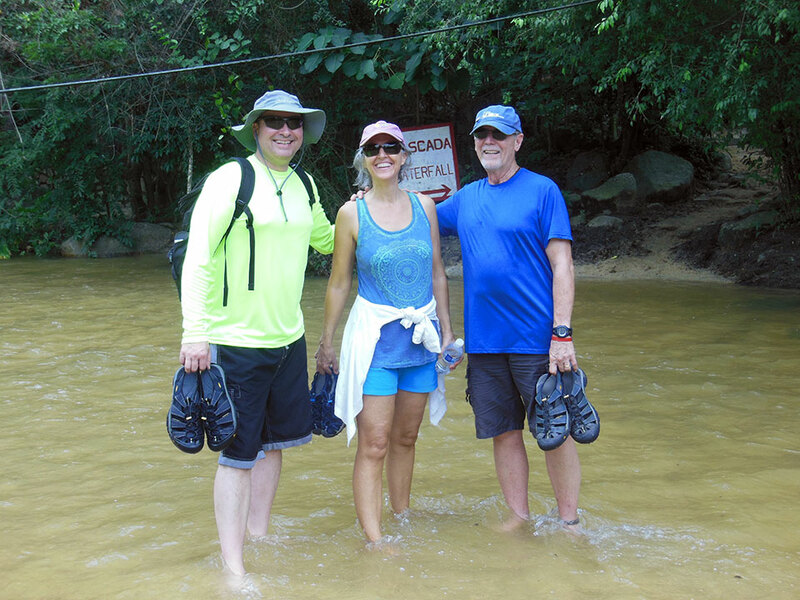 John, Heidi, and Frosty fording one of the two rivers on the hike up to the waterfalls at Quimixto. Just as we made it to the waterfalls it started to sprinkle. 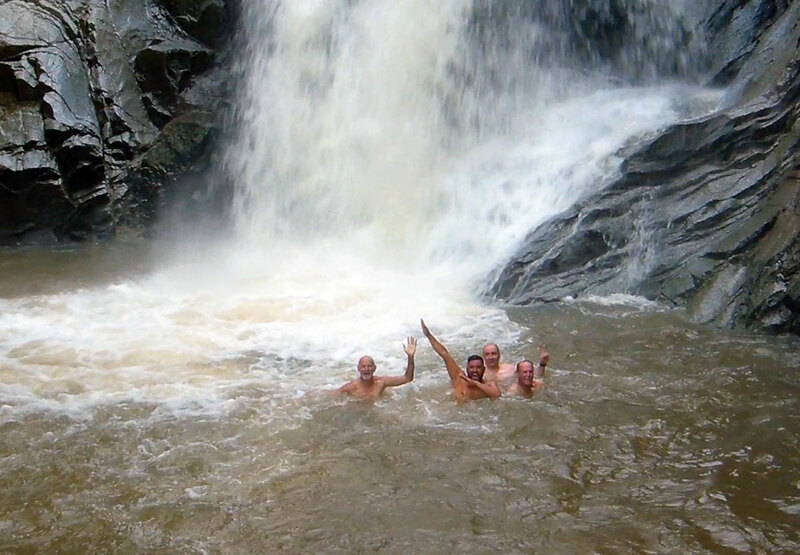 We didn't care, we were going swimming in the waterfalls. Such powerful force of water-- we couldn't even swim near the falls before being pushed away by the current. Round and round we went, swimming in the eddies, trying to reach the falls, and being pushed back out again. SO. MUCH. FUN!!! And such a nice, wet reward for our humid, sweaty hike up. Boys will be boys... playing in the waterfall made the Capitán's birthday! As luck would have it, there were two horses left at the waterfall and Patti and Frosty hopped on those with Juan leading them down the trail, while Kirk, John, and Heidi (still bare foot!) scampered back down the muddy trail as quick as we could. By the time we hit the beach, the rain had stopped, and the sun was back out and beating it's heat down on us again. Such is life in the tropics. 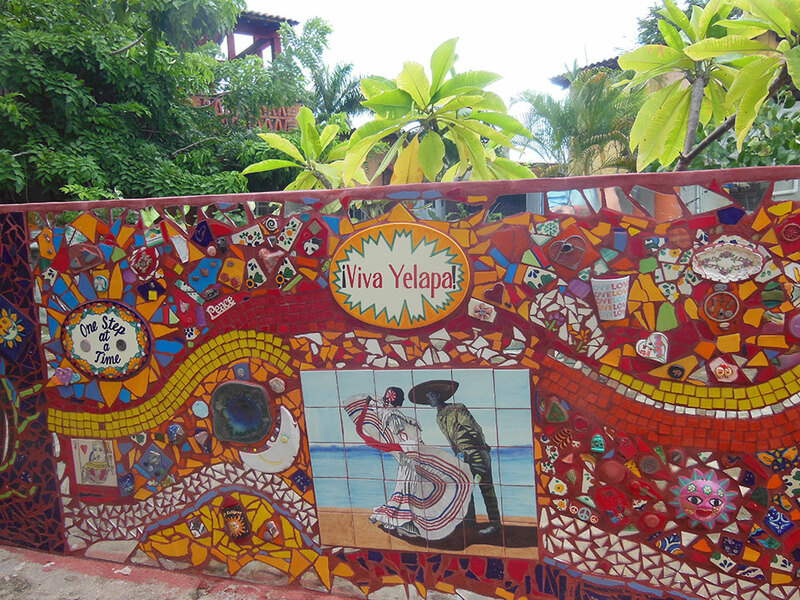 This beautiful art-wall in Yelapa is new since our last visit in December with Sara. Next stop, Yelapa, for a drink and walk around town...too bad it was Sunday afternoon and most things are closed in Mexico on Sunday afternoon, including the bars, restaurants, and shops. So we decided to take the short hike to the Yelapa waterfall (totally different waterfall experience, this one on a paved path through town.) Fortunately the waterfall bar was open, and serving STRONG margaritas--Happy Birthday Capitán! And luckily for all of us, Juan Bravo was only drinking water. A panga ride home rounded out our wonderful, fun-packed day--Muchas Gracias Juan Bravo and Israel. Once home we dined on leftover birthday cake and fresh organic berries, followed by a wonderful blues guitar mini-concert by our resident Blues Man, Frosty. If you've never heard this guy play, he's AMAZING, and he brought his guitar all the way down here just to play for us. Many THANKS Frost! We had planned to take Due West out for a daysail on Monday, but there was no wind to be found as we headed down to the marina. However, all was not lost... amazingly John was able to FIX one of our long-plaguing problems with MARIANNE, our trusty (NOT!) chart plotter was not receiving AIS. For you landlubbers, AIS is an automatic transmission that all commercial ships, many fishing boats, and some sailboats transmit showing their position, course, speed, and closest point of approach. This is especially helpful on night passages when it's much harder to discern some of this info with the naked eye and radar, and our chart plotter AIS receiver had been on the fritz since shortly after we left Seattle. Some of you may recall the adventures of Marianne off the Oregon coast? BIG THANKS to John for fixing this errant issue that had been baffling us for 2 years! All too soon the birthday weekend came to an end and it was time for our friends to head back home. We were so grateful for all of the Birthday love, well wishes, calls, and messages. And HUGE THANKS to John, Patti & Frosty for making the trek and the birthday weekend such a success. Photo credit: Hubert Haciski, Road Town, Tortola, British Virgin Islands. Our hearts are with everyone who's lost their homes and/or boats in the Islands. If you've not seen the reports, over 90% of the people have lost homes or had major damage to their homes. Including several friends of ours. Horrifyingly, there are two more hurricanes barreling down on the same area where the islanders have no shelter to protect them. There isn't enough food or water in the islands as we write this. We are doing our best to help from afar via SailorsHelping.org, and hope to be able to help out in person at some point soon too. If you are inclined to make a donation, SailorsHelping.org is an efficient, grass-roots organization of sailors, getting things DONE on the ground, now. Join their mailing list for ways you can volunteer your time from home (phone calls and emails) plus construction opportunities similar to Habitat for Humanity, to help rebuild the northern Caribbean islands. 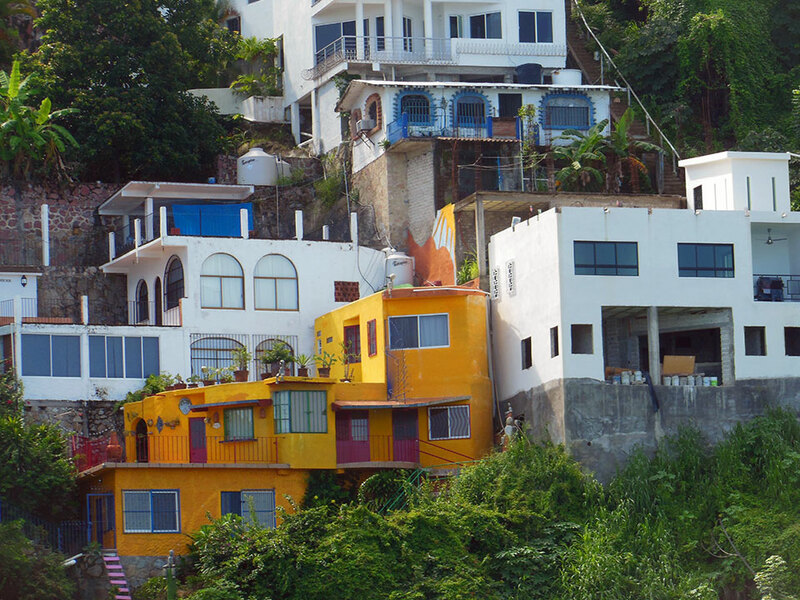 If you've ever traveled to the Caribbean, you know how special these islands are. You also know that tourism is the biggest part of their economy, and without infrastructure, there is no tourism, no livelihood. No bueno. Many of you are retired or have vacation days to use, and many of you have great skill sets to offer. Let's help to rebuild the islands we LOVE to sail and visit. The furbies laying on our snorkel gear--they love it every time we bring something from the boat to the condo, feels like "home". They want to move back aboard soon, and so do we. 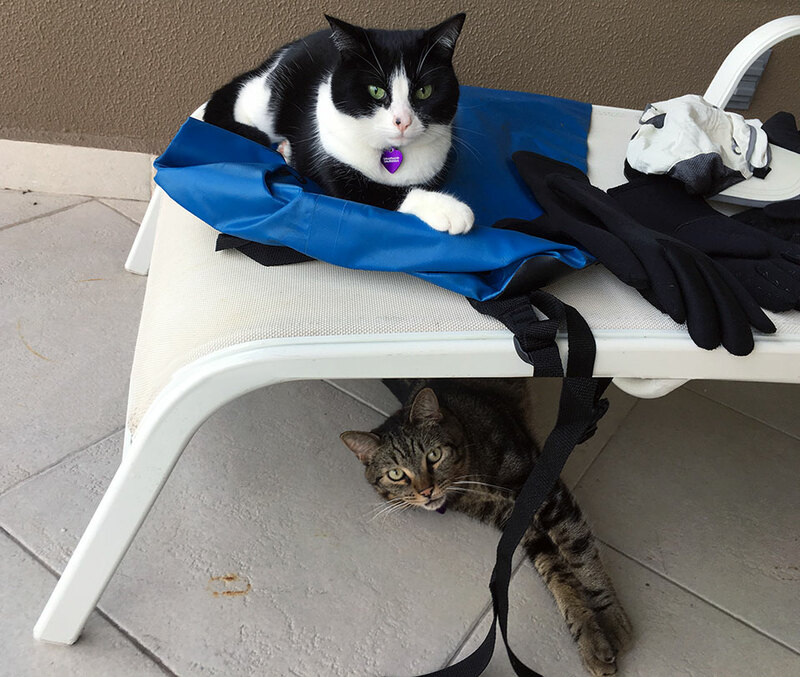 In case you missed it in the last blog post, The Sailing Adventures of Tosh & Tikka will be featured in a new book of short stories published by Kitty-Karma Books. Big Stories of the Small Cats Who Change Our Lives. All proceeds from the this book will go to fund cat rescue shelters around the globe. Please check out their FB page for more info and if you're a cat-lover consider a donation to help this book get published when their IndiGoGo campaign kicks-off on October 1st. A year from now we hope to be heading north back to Panama and through the Canal towards the Caribbean. And helping to re-build when we get to Irma and other hurricane damaged areas. Captain Kirk and the Starship Water Maker!